The objective of this paper is to assess the likely allocation effects of the current climate protection strategy as it is laid out in the National Allocation Plans (NAPs) for the European Emissions Trading Scheme (ETS). The multi-regional, multi-sectoral CGE-model DART is used to simulate the effects of the current policies in the year 2012 when the Kyoto targets need to be met. Different scenarios are simulated in order to highlight the effects of the grandfathering of permits to energy-intensive installations, the use of the project-based mechanisms (CDM and JI), and the restriction imposed by the supplementarity criterion. After opening up of the Interconnector, the liberalized UK natural gas market and the regulated Continental gas markets became physically integrated and the Continental gas price became dominant. However, in an interim period � after deregulation of the UK gas market (1995) and the opening up of the Interconnector (1998) � the UK gas market had neither government price regulation nor a physical Continental gas linkage. We use this period � which for natural gas markets displays an unusual combination of deregulation and autarky � as a natural experiment to explore if decoupling of natural gas prices from prices of other energy commodities, such as oil and electricity, took place. Monthly price data in the period 1995-1998 indicates a highly integrated market where wholesale demand seems to be for energy rather than a specific energy source. The recent volatility of short-run gasoline prices in the United States has resulted in calls for the government to intervene. This paper details a simple means of reducing that variability, utilizing federal tax policies, without eliminating the signaling role of prices in the medium- to long-term. If properly implemented, the gyrations in gas prices could be largely removed, with little impact on the revenue that the federal government generates through taxation. If applied to the markets in nations that have significantly higher gasoline taxes, essentially all price volatility could be removed. 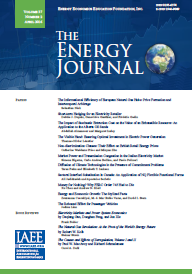 Prompted by the contemporaneous spike in coal, oil, and natural gas prices, this paper evaluates the degree of market integration both within and between crude oil, coal, and natural gas markets. Our approach yields parameters that can be readily tested against a priori conjectures. Using daily price data for five very different crude oils, we conclude that the world oil market is a single, highly integrated economic market. On the other hand, coal prices at five trading locations across the United States are cointegrated, but the degree of market integration is much weaker, particularly between Western and Eastern coals. Finally, we show that crude oil, coal, and natural gas markets are only very weakly integrated. Our results indicate that there is not a primary energy market. Despite current price peaks, it is not useful to think of a primary energy market, except in a very long run context. Carbon Abatement Costs: Why the Wide Range of Estimates? Estimates of marginal abatement costs for reducing carbon emissions derived from major economic-energy models vary widely. Controlling for policy regimes we use meta-analysis to examine the importance of structural modeling choices in explaining differences in estimates. The analysis indicates that particular assumptions about perfectly foresighted consumers and Armington trade elasticities generate lower estimates of marginal abatement costs. Other choices are associated with higher cost estimates, including perfectly mobile capital, inclusion of a backstop technology, and greater disaggregation among regions and sectors. Some features, such as greater technological detail, seem less significant. Understanding the importance of key modeling assumptions, as well as the way the models are used to estimate abatement costs, can help guide the development of consistent modeling practices for policy evaluation. A CGE model of South Africa is used to find the potential for a double or triple dividend if the revenues raised from an energy-related environmental tax are recycled to households and industry through lowering existing taxes. Four environmental taxes and three revenue-recycling schemes are compared. The environmental taxes are (i) a tax on greenhouse gas emissions, (ii) a fuel tax, (iii) a tax on electricity use, and (iv) an energy tax. The four taxes are constructed such that they have a comparable effect on emissions. The revenue is recycled through either (i) a direct tax break on both labour and capital, (ii) an indirect tax break to all households, or (iii) a reduction in the price of food. A triple dividend is found � decreasing emissions, increasing GDP, and decreasing poverty � when any one of the environmental taxes is recycled through a reduction in food prices. Developing an energy policy from a collection of programs is made more complicated because there is no single value that can be used as a best estimate of the contribution of a single policy, despite the ability to estimate the impact of the complete suite. In this paper we illustrate the problem and use cooperative game theory to show one way to estimate individual effects of a policy goal in the context of collective estimates. Using an economic equilibrium model, we illustrate the behavior of four policies, namely, a gasoline tax, CAFE standards, a carbon tax, and drilling the Arctic National Wildlife Reserve, through their Shapley value contributions in measuring the impact of each in the context of a suite of policies. We apply the Shapley value to measure the average marginal reduction in imports for each policy, and present a number of scenarios that illustrate how the Shapley value behaves as a measure of policy contribution. We examine the volatility characteristics of the NYISO Day Ahead and Real Time electricity markets for peak hours from January 2001 to June 2004. GARCH models are used to study the differences in volatility across zones. We find that price volatility is higher but less persistent in the Real Time market than in the Day Ahead market. Furthermore, we document the importance of transmission congestion and empirically estimate its impact on volatility in electricity prices. We also examine the Day Ahead premium and show how it is related to volatility in Real Time prices. The implications for participants in these markets are discussed.